In 2000 Rye Barcott spent part of his summer living in the Kibera slum of Nairobi, Kenya. He was a college student heading into the Marines, and he sought to better understand ethnic violence-something he would likely face later in uniform. He learned Swahili, asked questions, and listened to young people talk about how they survived in poverty he had never imagined. Anxious to help but unsure what to do, he stumbled into friendship with awidowed nurse, Tabitha Atieno Festo, and a hardscrabble community organizer, Salim Mohamed. Together, this unlikely trio built a non-governmental organization that would develop a new generation of leaders from within one of Africa's largest slums. Their organization, Carolina for Kibera (CFK), is now a global pioneer of the movement called Participatory Development, and was honored by Timemagazine as a "Hero of Global Health." Barcott continued his leadership in CFK while serving as a human intelligence officer in Iraq, Bosnia, and the Horn of Africa. Leading Marines in dangerous places, he took the tools he learned building a community in one of the most fractured parts of Kenya and became a more effective counterinsurgent and peacekeeper. It Happened on the Way to Waris a true story of sacrifice and courage and the powerful melding of military and humanitarian service. It's a story of what America's role in the world could be. Rye Barcott founded Carolina for Kibera (CFK) with Salim Mohamed and Tabitha Atieno Festo while he was an undergraduate at UNC Chapel Hill. After graduation, he served as a Marine for five years on active duty. 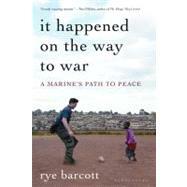 In 2006 ABC World News named then Captain Barcott a Person of the Year for his dual service to Kibera and the Marine Corps. As a Reynolds Social Entrepreneurship Fellow, he earned master's degrees in business and public administration from Harvard. He is currently a member of the World Learning Board of Trustees and a TED Fellow living in Charlotte, North Carolina.